Context: on the shelf at our friends’ place in Dubai so I thought I’d give it a go. Read a lot of Bryson and I have to say that this wasn’t his best. In fact, the title kind of sums it up for me really. This is not up there in the realms of comedic genius as with the two Notes books or Walk in the Woods. He relies much more on hyperbole and obviously fictitious happenings than in other writing I’ve read of his. The book’s also a bit dated now. His description of Sarajevo is markedly different from my experience of it last year post-Balkan conflict. In all it felt a bit contrived and while there were moments that had me laughing out loud, they weren’t as frequent as I’d hoped. In winter Hammerfest is a thirty-hour ride by bus from Oslo, though why anyone would want to go there in winter is a question worth considering. But that of course is neither here nor there. Very helpful review, as always, Arukiyomi. I am a big fan of Bill Bryson [having read 2 1/2 of his books…] but this one is maybe one I won’t pay full-price for. ‘Specially since I have a few more unread ones of his on my shelf here. He is truly hilarious though….. in a genuine way. One of those authors that actually CAN make you spew stuff nostrally…… don’t even ask me how I know this……. thanks Cip… “spew stuff nostrally” great image mate! Thanks for your review. 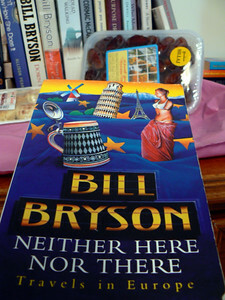 I have enjoyed some of Bill Bryson’s books in the past but think I will give this one a miss. I really love your photos and context notes. And I love to see the actually book you read, rather than an Amazon style cover shot. I think it makes this weblog different to many of the others!